Another DutchWare original: The Tarp Flyz. This is another tarp rigging hardware option that works a little like the Nite Ize Figure-9 hardware, but with two-to-one mechanical advantage to get the line taut. The line is secured by wrapping it around the “antenna” of the Flyz. The Tarp Flyz are designed to use small-diameter line no larger than 1.75mm. The Tarp Flyz stays attached to the line and a lot of hangers keep the Flyz tied or attached as close as possible to the tarp ridgeline tie-out. 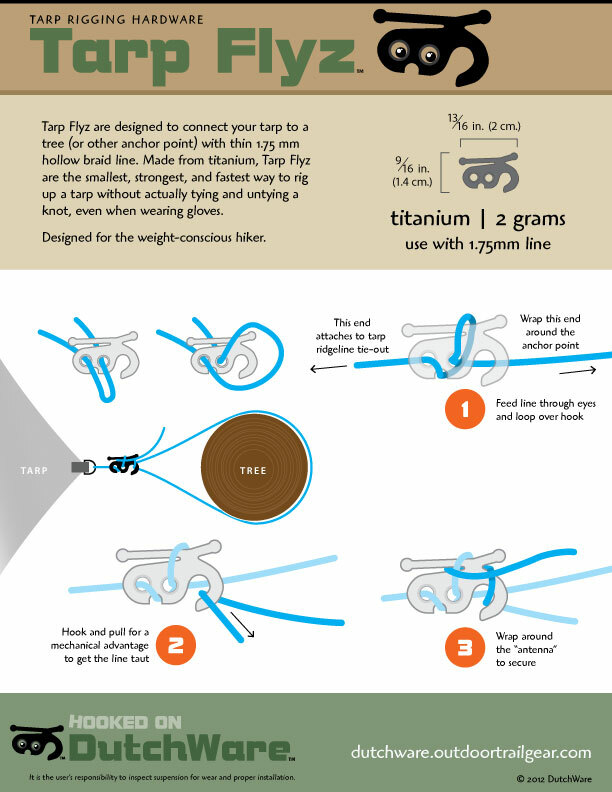 Tarp Flyz are cast from titanium and weigh only 2 grams.